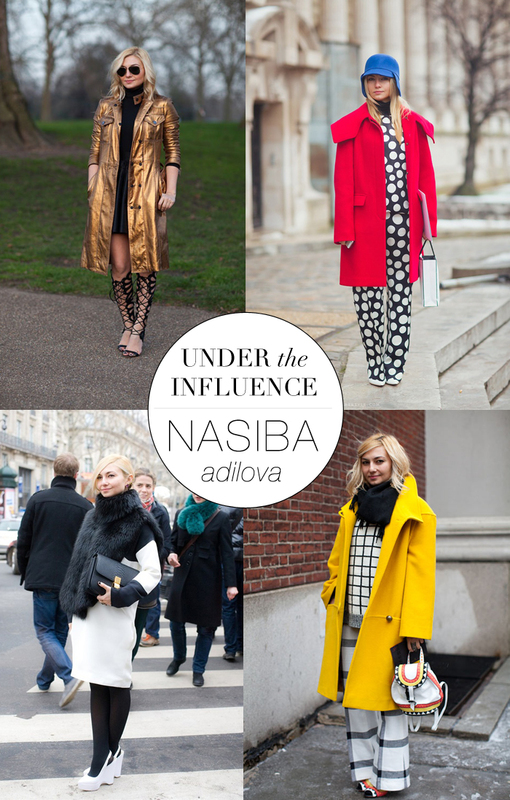 This edition of Under The Influence features Russian street style star, Nasiba Adilova. The best thing about this beauty? She lives in Dallas! She’s always front row at the biggest shows during fashion week and constantly snapped next to co-worker (and another street style master) Miroslava Duma. Thank you to Nasiba for sharing a little of her exciting job and enviable lifestyle! Tell me a little about your background in fashion and how you came to work for Buro 247? I work with my friend Miroslava Duma’s website which she formed about 2 years ago, called Buro247.ru. It is a fashion and luxury market news portal that provides news 24/7. After the launch the website went on to be a mega hit not only in Russia but also across the globe and now there are Buro247 licensed versions being opened in the Middle East, Asia, Ukraine, Austria, Turkey, Kazakstan to name a few. Mira has already sold the license to Eastern Europe and buro247.hr has been operating there for over 8 months. It is a hugely successful project and I am very honored to be a part of it. I run US and UK markets, and am partnering with Mira in a launch of a much needed English version of Buro in the UK. I would also add that I do a bit of editorial work, and quite a bit of business development. I don’t do fashion journalism on dat to day basis, I do it when the right opportunity presents itself, or when I feel I found a really great subject. I am very interested in, and am in constant discussions with Miroslava, about launching a fashion based e -commerce driven smart phone application. So I would say that’s the end goal. We see Buro247 as a brilliant platform for developing and growing the editorial and publishing side of the business. The next step for us would be more business oriented. Your street style is always impeccable, but there must be a lot of pressure to look fabulous all the time (especially when hanging around the likes of Miroslava Duma). Do you have any designers that you gravitate towards most or feel most comfortable wearing? Thank you very much! I would not say its impeccable, as I make mistakes, but I try to learn and grow from them. I would say that I try to experiment quite a bit and play around with clothing from many different designers. Some of my most frequent choices are probably Mary Katrantzou who is a dear friend and whom I adore, Celine, Stella McCarney. You seem to always be living out of a suitcase, you travel so often! What are your favorite beauty products to keep you looking fresh and feeling good on the go? Very well noted, unfortunately it is true – I live out of a suitcase! I will let you in on my beauty secret. I drink Noni juice every day, and every morning on an empty stomach I drink a lemon shot (lemon, olive oil and warm water). I also get facials after every long haul flight! A product which I really like are face mists. What are your five favorite pieces in your closet right now? An amazing linen celine coat which is an archive piece and which I found in London on sale, Chanel camelia sneakers, Stella Mccartney white jumper and my yellow vintage Christian Lacroix coat I found in a vintage shop in Milan. Speaking as a Dallas resident, where are your favorite spots in the city and why? Jake’s burger for best cheeseburger in town, T room for best salads+ sandwiches, Javier’s for best margarita! I know you recently shot a campaign for Dallas-based Russian designer Kira Plastinina – what other cool projects are you working on this year? I am actually working with Kira in representing her brand Lublu. I’m helping her with her opening which is coming up and organizing a super chic dinner for “Fashion It girls” from all over the world. I am also working on a project with Mary Katrantzou helping to bring her to Dallas, and there are quite a few exciting projects in store! Any advice you have for aspiring journalists or street style hopefuls? I would say to stay true to yourself and be original! Try not to follow the trend, do what feels right. There is always someone who will be interested in your opinion and what you have to offer. For more on Nasiba, follow her on Instagram! Great interview! I had no idea she lived in Dallas, she is just such an international style superstar. It’s always nice to learn more about the girls we see so many street style pictures of. Very interesting interview! You asked great questions, Merritt! PS- I’m hosting a giveaway on my blog with Gemma Collection, a Dallas jewelry boutique! A 14 kt. gold overlay Texas state necklace is up for grabs! I’d love for you and your followers to enter! She always looks impeccable. I love the black + white look the best, but aren’t they all amazing? This is so awesome! And she is just so cool. Great interview :). Love the blog girl! This was great! I really enjoyed reading this article, Merritt. Your questions were so good and well-thought-out, not just the typical run of the mill fashion q&a!! Love! Nice interview! Great outfits too.